MONROE—Stratford High senior Julia Torreso wanted that eighth win. Sure, the Red Devils had already clinched a spot in the Class L state tournament, but an eighth win meant the team would have rightfully earned a berth in the postseason. Eight wins and you’re in, right? Otherwise, sure, you might still get in when the CIAC fills out its field at 32 teams, but Torreso and the undermanned Red Devils wanted that eighth win as a statement for the program. Unfortunately, Stratford fell short of that quest on Monday night as Masuk, also seeking its eighth win, celebrated its Senior Night with a 53-43 win. The Red Devils, who were missing three players from its main rotation, including two starters, showed plenty of heart. Masuk led by 14 at the half (31-17) and opened that lead as high as 17 (37-20) in the third quarter before the Red Devils threw a scare into the host Panthers. With three minutes to play, Stratford had surged back to within six points and 45-39. Six foul shots down the stretch iced it for Masuk, which ended the regular season with an 8-12 mark. Torreso had 20 points to pace the Stratford effort while Abby Anka added eight. Both teams were thrown for a loop by the officiating, which seemed to whistle every touch foul/reaching foul while letting a lot of the more physical stuff go. All told, 47 fouls were called in a game that wasn’t very physical by high school basketball standards. Masuk, meanwhile, used its size advantage to its advantage, as well. Stratford was without junior Keryna Upchurch (concussion) and freshmen Amanda Ogrodowicz (flu) and Angelyna Upchurch (hand injury)—all front-court players. Down 17, though, it was Stratford’s two seniors on the court who led the surge back into the game. Toresso scored a bucket and three straight foul shots before Serena Mbachiantim drained a 3-pointer. At the start of the fourth quarter, it was four foul shots by Torreso that made it an eight-point game (45-37) and after Masuk missed a trio of freebies, Anka hit Torreso for a lay-up to make it a six-point game (45-39 with three minutes to play. It was as close as the Red Devils would get. 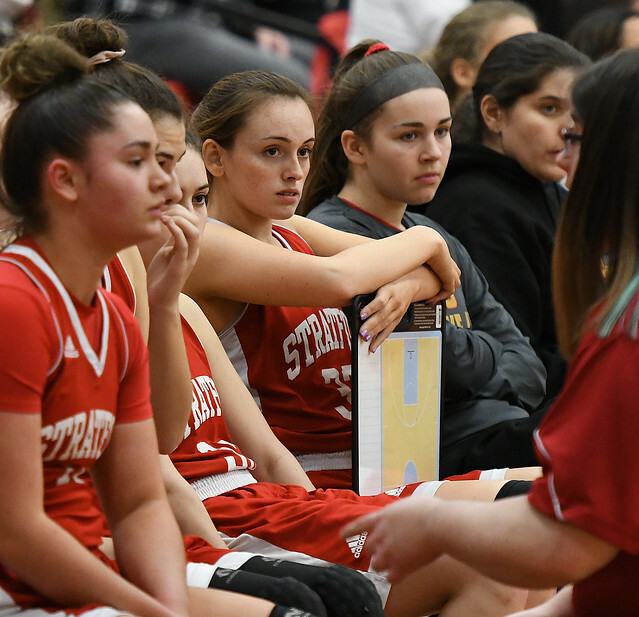 Currently situated in 28th place in the Class L standings, Stratford will likely take on the fifth-seeded team in the tournament—likely East Haven, which was the fifth-ranked team in the state, according to the weekly gametimeCT.com poll.